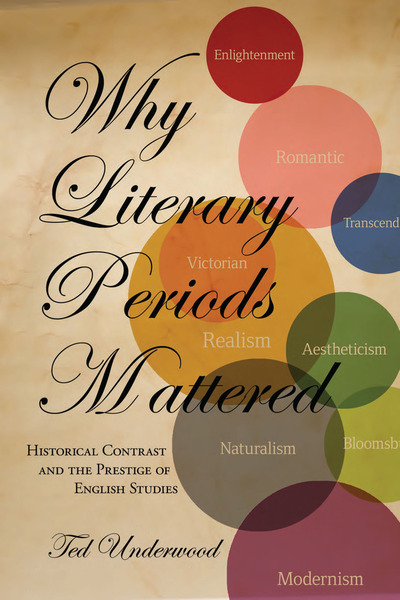 The graduate seminar I’m leading, Periodization, is currently finishing up Ted Underwood’s book Why Literary Periods Mattered: Historical Contrast and the Prestige of English Studies (Stanford, 2013). The book argues that periodization (splitting history up into periods like ‘medieval,’ ‘Romantic,’ ‘Victorian,’ ‘antebellum American’) has dominated literary-historical research almost since the hiring of the first English professor, in 1828. 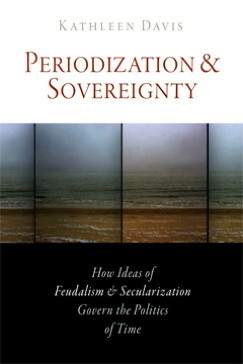 Underwood sees periodization as fulfilling a social function, namely cultivating readers through an experience of historical discontinuity. In the 1990s, that social function was called into question, yet periodization survived institutionally, in hiring, in the curriculum, and in graduate training. But the authority of periodization does not rest on the convenience of boundaries. It springs from a commitment to discontinuity that has long defined the cultural purpose of literary studies, and that contemporary scholars still feel as part of their disciplinary identity. This commitment to discontinuity goes far beyond the dates of anthologies and survey courses; it shapes critical discourse from top to bottom. The preceding chapters of Why Literary Periods Mattered earn the big claim about discontinuity in the second paragraph here. This passage understands something about literary periodization that nearly all of periodization’s defenders, and many of its critics, leave out. Defenses of periodization either exaggerate moments of rapid cultural change at the beginning and end of a period, reifying the category, or else (and this is becoming the standard move, I think) they dismiss periodization as a “mathematical convenience,” inevitable and not worth squabbling over. Much criticism of periodization mirrors these two moves, either exaggerating continuity across period boundaries or proposing arbitrarily defined new periods. What either reaction fails to do is to face up to periods as “social institutions”–and, I’d add, institutions that are not thought to possess equal social value. Underwood recommends quantitative methods as a counterbalance to periodization’s single-minded focus on discontinuity, a project he now pursues in Distant Horizons: Digital Evidence and Literary Change (Chicago, 2019). The last chapter of Why Literary Periods Mattered appears in our syllabus in a unit on Language / method, featuring examples of work that moves beyond traditional periodization. Other scholars in Language / method are David Blackbourn, Seeta Chaganti, Joan DeJean, Barbara Fuchs, Reinhart Koselleck, and Kevin Ohi. Language / method fits into our Institutions movement. In the next movement of the course, Politics, we’ll address what periods-as-social-institutions have come to mean, politically. Graff, Gerald. “How Periods Erase History.” In On Periodization: Selected Essays from the English Institute, ed. Virginia Jackson (2010), paras. 97-123. Ohi, Kevin. Dead Letters Sent: Queer Literary Transmission. Minneapolis: University of Minnesota Press, 2015. Simpson, James. “Diachronic History and the Shortcomings of Medieval Studies.” In Reading the Medieval in Early Modern England, ed. Gordon McMullan and David Matthews (Cambridge, 2007), pp. 17-30.